Lavender Linen Mist in Europe, the long-ago custom of placing laundry to dry on sprigs of lavender produced exquisitely aromatic bedsheets, is now made easy, with our Linen Mist. What could be more soothing and luxurious than slipping between softly scented sheets and laying your head upon a delicately fragranced pillow. This is one of the most relaxing and subtle ways to be lulled off to sleep. These large 32 oz bottles have an easy to use trigger, when gently squeezed produces a fine mist to cover any laundry, not just your bed sheets (as we never spend that much time in bed to enjoy the full effect). 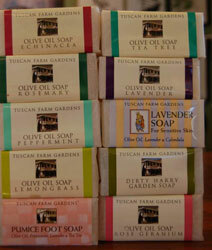 Tuscan Farm Garden Soap - Softly scented with pure essential oils which is added to handmade small batches, and then hand cut. This soap is gentle, nourishing and moisturizing. No wonder it is on the Pick’s List. It can be used as a bar shampoo or shaving soap. BONUS Eco-friendly pre-laundry stain remover. Rub stain with wet soap, wash as usual, Voila! 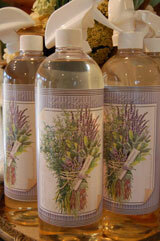 Pure essential oils produce a softly scented bar soap. Although pure essential oils are less stable than harsh synthetic fragrance oils Tuscan Farm Gardens of British Columbia, ( that right, made in Canada) continue to use pure essential oils and are committed to an all natural product. Enjoy the difference! Choose from 10 different soaps, each with its unique aroma. Fine Bone China Tea Cups are a type of porcelain first developed in Britain in which calcined ox bone, is made into bone ash, is then a major constituent in creating china, thus the name “Bone China”. Due to the richness of calcium, bone china is characterised by high whiteness, translucency, lightness and strength.“I just love these cups they are pretty and very strong, they don't chip or scratch.” Our beautiful cups come in many different classical shapes and styles, are dishwasher safe and have a large handle for a easy grip. Onion Savers are the hottest thing for your fridge. One of my real kitchen pet peeves is “What on the Earth am I supposed to do with this half of an onion?” Inevitably, I throw it into a baggie. And then you all know what happens next, everything from the watermelon to the butter ends up with a onion-ish taste. Not terrible appetizing. That’s why these onion savers are true brilliance in my books! They seal up ultra tight, giving you lovely fresh onion inside, with no lingering odours to drift around the refrigerator! 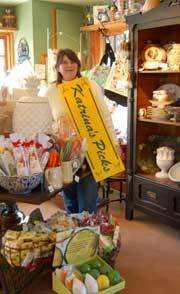 Lemonade comes in many forms and types for everybody's taste. Either old fashioned or traditional, there is nothing more refreshing than a drink in the garden after a long day weeding of cold Lemonade. 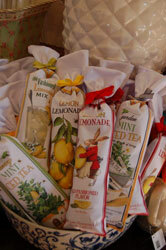 This beautifully packaged product is wrapped in a reusable flour sack bag and contains quick to dissolve crystals. All you need to add is the lawn chair and book.